Engineers have developed 3D printed devices that can track and store their own use — without using batteries or electronics. Instead, this system uses a method called backscatter, through which a device can share information by reflecting signals that have been transmitted to it with an antenna. [dropcap style=”font-size: 60px; color: #9b9b9b;”]C[/dropcap]heap and easily customizable, 3D printed devices are perfect for assistive technology, like prosthetics or “smart” pill bottles that can help patients remember to take their daily medications. But these plastic parts don’t have electronics, which means they can’t monitor how patients are using them. Now engineers at the University of Washington have developed 3D printed devices that can track and store their own use — without using batteries or electronics. Instead, this system uses a method called backscatter, through which a device can share information by reflecting signals that have been transmitted to it with an antenna. The UW team presented its findings at the ACM Symposium on User Interface Software and Technology in Berlin. Previously the team developed the first 3D printed objects that connect to Wi-Fi without electronics. These purely plastic devices can measure if a detergent bottle is running low and then automatically order more online. The researchers tackled the monitoring problem first. In their previous study, their system tracks movement in one direction, which works well for monitoring laundry detergent levels or measuring wind or water speed. But now they needed to make objects that could monitor bidirectional motion like the opening and closing of a pill bottle. “Last time, we had a gear that turned in one direction. As liquid flowed through the gear, it would push a switch down to contact the antenna,” said lead author Vikram Iyer, a doctoral student in the UW Department of Electrical & Computer Engineering. Both of the antennas are identical, so the team had to devise a way to decode which direction the cap was moving. In addition to tracking, for example, pill bottle cap movement, this same method can be used to monitor how people use prosthetics, such as 3D printed e-NABLE arms. These mechanical hands, which attach at the wrist, are designed to help children with hand abnormalities grasp objects. When children flex their wrists, cables on the hand tighten to make the fingers close. 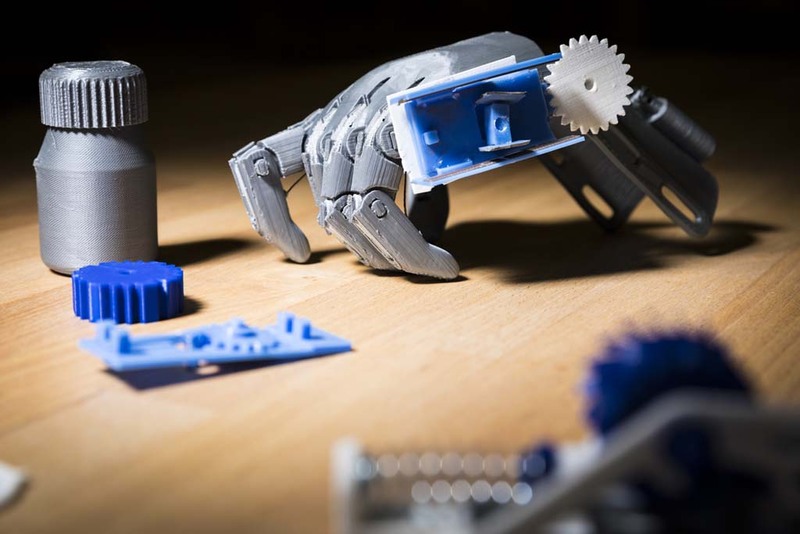 So the team 3D printed an e-NABLE arm with a prototype of their bidirectional sensor that monitors the hand opening and closing by determining the angle of the wrist. The researchers also wanted to create a 3D printed object that could store its usage information while out of Wi-Fi range. For this application, they chose an insulin pen that could monitor its use and then signal when it was getting low. This method requires a mechanical motion, like the pressing of a button, and stores that information by rolling up a spring inside a ratchet that can only move in one direction. Each time someone pushes the button, the spring gets tighter. It can’t unwind until the user releases the ratchet, hopefully when in range of the backscatter sensor. Then, as the spring unwinds, it moves a gear that triggers a switch to contact an antenna repeatedly as the gear turns. Each contact is counted to determine how many times the user pressed the button. These devices are only prototypes to show that it is possible for 3D printed materials to sense bidirectional movement and store data. The next challenge will be to take these concepts and shrink them so that they can be embedded in real pill bottles, prosthetics or insulin pens, Mankoff said. Ian Culhane, an undergraduate student in the UW Department of Mechanical Engineering, is also a co-author on this paper. This research was funded by the National Science Foundation and Google Faculty Awards. New Algorithm Efficiently Finds Antibiotic CandidatesEmployers Try Out Our Job Board!